Umami Burger has been in Costa Mesa for more than a year or two, but I somehow never got the chance to go there until recently with Stacy. It was her first time also. Note to self: Parking at The Camp is no bueno. Since the restaurant was located at The Camp, the restaurant itself was pretty cramped. We waited for several minutes to get seated since it was a little busy during dinner time. The whole layout reminded me of Chipotle with the metal decor and Sprinkles Cupcake from the wooden utensils and plates. We’ll start with the tempura onion rings. The onion rings were nothing that special. 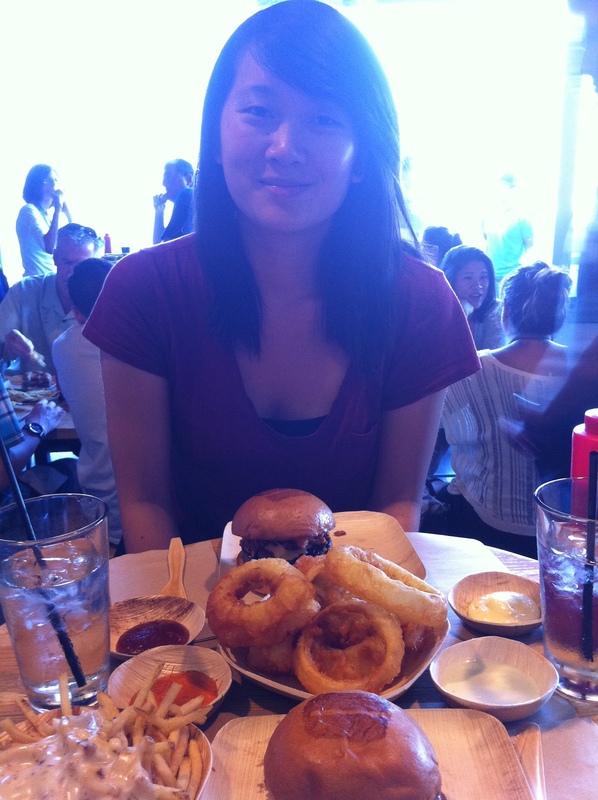 I would have to say that the onion rings I tried in Korea were better than the onion rings at Umami. That’s not the point. Finding a distinctive quality of onion rings is challenging because onion rings end up all tasting the same to me. They were definitely greasier than normal and too heavy for my taste. The fries we had were one up better than the onion rings. The special sauce they had on top of the fries were simple, yet pleasing to the tongue. Now the burgers. I ate my Umami burger first which I do and don’t regret doing. I regret eating it first because I liked it more than the Manly Burger. I wish I could’ve saved the best for last. I don’t regret eating it first because I liked it more than the Manly Burger. Makes sense, right? 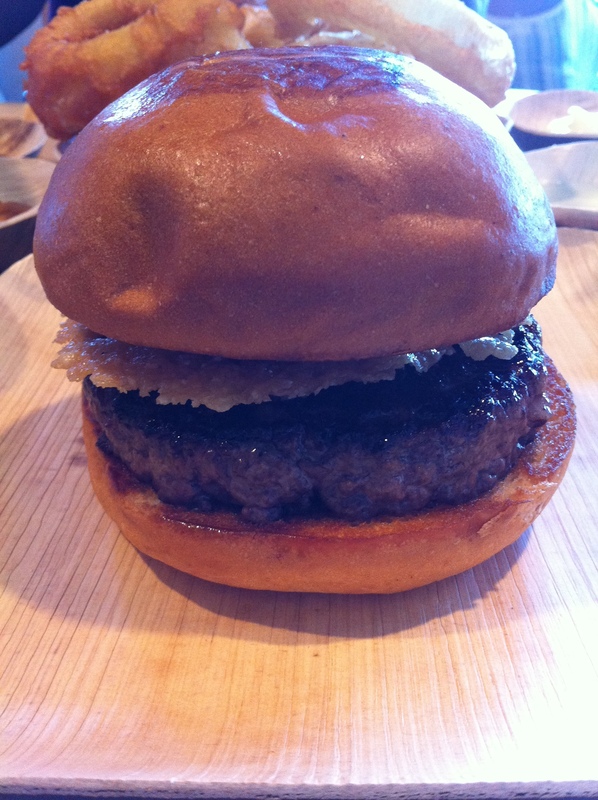 The Umami burger was simple and juicy. I’m not a big eater of eating rare cooked meat but the Umami Burger was an exception. The Manly Burger was a tad bit messy since it had thick bacon pieces in the burger. It was not as flavorful as I wanted it to be. 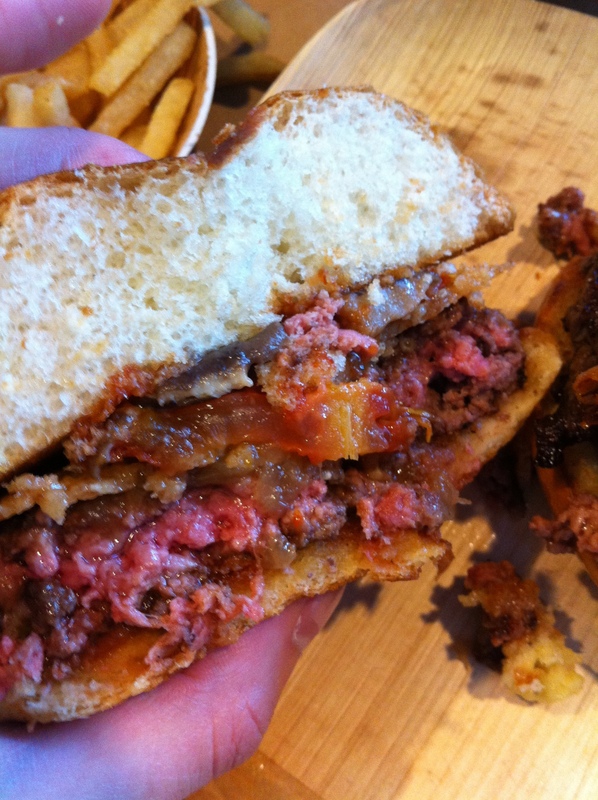 When it comes down to it, I would pick the Umami Burger over the Manly Burger only because of its simplicity. Surprisingly at the end of our meal, we were stuffed to the max. Just the burgers would have been good enough to eat. 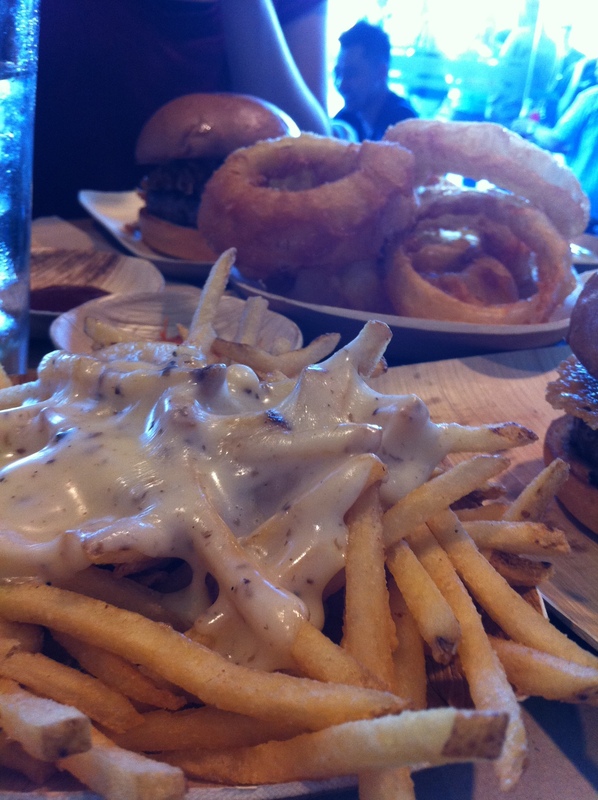 The carbs and grease in the fries and rings filled us up too quickly. At the end of our Umami experience, we told ourselves it’s better to go to In-N-Out. It’s cheap and darn good. Can’t wrong with that at all. We need to try Myxs for our next burger adventure.